View cart “Dil Chahta Hai” has been added to your cart. Classic Bollywood poster of the blockbuster Hindi film, Dil Chahta Hai (2001) for sale. This is an actual surviving classic Bollywood poster of the 2001 romantic comedy that starred Aamir Khan, Saif Ali Khan and Akshaye Khanna in lead roles. Dil Chahta Hai was the first film written and directed by Farhan Akhtar. The film bagged numerous awards at both the National Film Awards as well as the Filmfare Awards. In 2001, the film won National Film Award for Best Feature Film in Hindi and has attained cult status over the years, making this Dil Chahta Hai poster highly collectible! 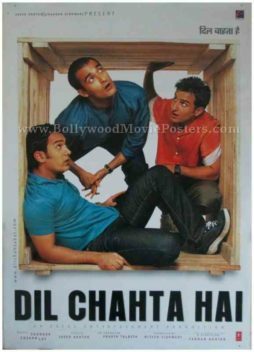 Printed and circulated during the first release of the film (somewhere in the early 2000s), this Dil Chahta Hai poster was printed for publicity of the film but never ended up being used. Actress Preity Zinta is seen in a large close up prominently in this Dil Chahta Hai poster. Superstar Aamir Khan is seen in a smaller still in the background. Classic Bollywood movie poster of the blockbuster Hindi film, Dil Chahta Hai (2001) for sale. This is an actual surviving classic Bollywood film poster of the 2001 romantic comedy that starred Aamir Khan, Saif Ali Khan and Akshaye Khanna in lead roles. Dil Chahta Hai was the first film written and directed by Farhan Akhtar. In 2001, the film won National Film Award for Best Feature Film in Hindi and has attained cult status over the years, making this Aamir Khan poster highly collectible! Printed and circulated during the first release of the film (somewhere in the early 2000s), this classic Bollywood poster was printed for publicity of the film but never ended up being used. The three lead actors are seen prominently in this glossy Aamir Khan movie poster. This is an actual surviving classic Bollywood movie poster of the 2001 romantic comedy that starred Aamir Khan, Saif Ali Khan and Akshaye Khanna in lead roles. Dil Chahta Hai was the first film written and directed by Farhan Akhtar. In 2001, the film won National Film Award for Best Feature Film in Hindi and has attained cult status over the years, making this poster highly collectible!